Hi lovelies! Today I have a super quick post for you. 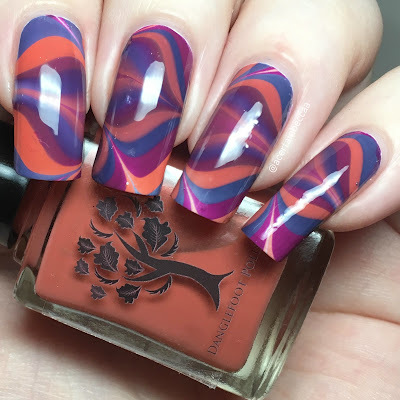 After swatching the Danglefoot Nail Polish Tearjerks Collection (post here), I couldn't resist testing if the three cremes watermarbled - and they do! After painting a white base, I made rings of all three ('Littlefoot's Mum', 'I Love you Always, Time is Nothing', and 'I'll Never Let Go Jack'), drew a quick pattern, and dipped my nails in. Here's the finished look! What do you think? Considering this is only my second water marble attempt, I'm very happy with how it turned out! If you weren't convinced on these three cremes, you have no excuse now! The Danglefoot Nail Polish Tearjerkers Collection is available here.